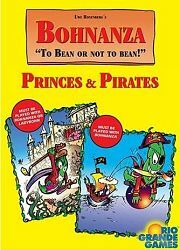 Bohnanza: Princes and Pirates is an expansion to Bohnanza or Bohnanza: Ladies and Gangsters (depending on which mode you are playing). Princes may be played with either base Bohnanza or the Ladies mode of Bohnanza: Ladies and Gangsters and has bean princes making their way to sleeping beauty in the king’s castle. The prince that reaches the castle with the most gold may awaken sleeping beauty with a kiss and win the game. Pirates offers enough components for up to seven players and must be played with the base game, Bohnanza. Unlike original Bohnanza where players harvested beans and immediately sold them for gold, Pirates allows players to load up harvested goods on ships to sell at a higher profit in other markets. However, pirates are waiting at sea to steal the players cargo of beans.